A surprise amongst German PC titles last year yet hardly noticed before it' s release last Christmas, Patrician 2 became the number one best-selling PC game with almost 150.000 copies sold in just nine months. It has achieved excellent ratings of up to 95% and numerous awards from virtually all German gaming magazines. Patrician 2 has reigned in the market against all competition and has one of the largest and most active fan communities in Germany. Competition is welcomed and no longer feared! Patrician 2 covers the high time of the middle age trade community in central Europe called the Hanseatic League, from 1300 until around 1450. The game's main aspects are trading and the development of towns with strategy, combat, exploration and sieges accompanying the gamers career. 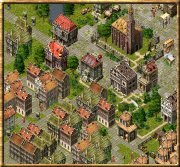 Can you, starting as a minor merchant, master the challenge to become Lord Mayor of your home town or even Alderman, the Chairman of the Hanseatic League? In the beginning you chose your hometown and set up your individual difficulty level, depending on your expertise and whether you prefer more action (i.e. more pirates, sea battles and sieges) or the less violent part of "just" trading - which, of course, is a challenge in itself. Further options are a historically correct or random production in the different towns of the Hanseatic League, realistic or low demands of your fellow citizens, different campaigns and two different multiplayer modes - hot seat as well as local area network with up to eight players. Not to forget you may set the starting year of your career. For example, in 1300 not all ships are available but cities are rather small and competition is just forming whereas in 1400 you have instant access to all types of ships but competition is already well developed and most trading spots in the Mediterranean Sea are already discovered. There are two main views in the game. The local or town view, being used mostly for all trade and building activities as well as for diplomacy and sea battles . This view shows all of your surrounding in great detail. More than 40 different buildings, most of them in three different sizes, reflecting wealth or amount of people living in them and in different styles, varying from town to town, showing the typical elements of the different countries, from Belgium to England, Germany to Sweden or Poland to Norway. The towns with their buildings, citizens, animals ansd surrounding countryside are beautifully rendered. Major events are underlined by high quality videos. This map offers a good overview of all your activities, shortage of goods, sieges, trade embargoes, sea battles and so on. If you only want to trade you do not even have to switch to town map, just chose your ship and the town you want to trade with and you're done. Every town produces certain goods and needs other goods which it can’t produce. Wine, for example, is produced in high quantities in Cologne and Bruges but not at all in Riga or Novgorod. If you’re trading for fur you’re better off directing your ship to Russia and not to Hamburg. Trading goods wisely will give increase your coffers which allows you to build new ships and expand your trade empire. The trade system reflects all your activities. Buying goods means to reduce the amount of goods available and increase the demand, thus the more you buy the more the price will increase. The more you sell the lower the demand will get and therefore the price you may achieve for each additional goods will actually decrease accordingly. However, a profitable trading route can turn into a source of heavy losses if a rare product suddenly becomes available in high quantities. Time is crucial as it takes time for you to transport goods from one town to another and all the while your competitors are doing the same! All goods can be produced over the time, however not all goods can be produced in every town. The player has to set up trading offices in several towns to be able to produce all goods himself. To make things really challenging you usually need a chain of supplies to keep your business running. For example, if you want to produce iron goods, you need to buy or produce timber and iron ore first. Handling these kind of logistics can get very demanding. To gain recognition and rank in your home town you need to take care of it. It is better to lose some money feeding your citizens over the winter by selling grain below market price than to let them go hungry. Keep you citizenry happy by donating money to the church, feeding the poor, or offering credits with low interest rates to fellow traders. Build housing for your employees to keep them in your town and make money with the rent later on! All This will make you famous very soon. Should you decide to walk the dark side of life, trade weapons, bribe, co-operate with pirates or even work as a pirate yourself, you may win a fortune fast - but at the risk of your respected reputation. Is it worth this lifestyle? It's up to you! No other game offers this amount of freedom! Do you expect the middle ages to be a peaceful and quiet time? Full of harmony, low pollution and friendly folks? Alas, the first pirate you encounter will be delighted to rip you and your dreams apart! Arm your ships, set up convoys, hire good captains and show them who you are, defending the innocent and hunting down the evil doers. Not your style you say? Well, hire pirates or thieves to steal from your competitors warehouses or become a feared pirate yourself. It’s up to you. You decide what game you want to play, good or evil. Think you can reach the borders of Patrician 2? Think again!!! 150.000 gamers thus far can't tell where the limits are, not even the developers know! There is no artificial limitation, no border, no end - Patrician 2 is fully dynamic real-time trade strategy! Build for twenty to fifty hours of rewarding gameplay with a dozen ships and thousands of citizens. The most advanced players thus far have created empires of more than one million citizens, 1400 ships under theircommand, and more than 50.000.000 Gold in cash! Interested in exploration? Find the most profitable trading spots in the Mediterranean Sea and gain wealth and reputation. Still not enough for you? Well, it is said that the best players can even discover America years before Christopher Columbus... Patrician 2 is fun, rewarding, challenging and alarmingly addictive!